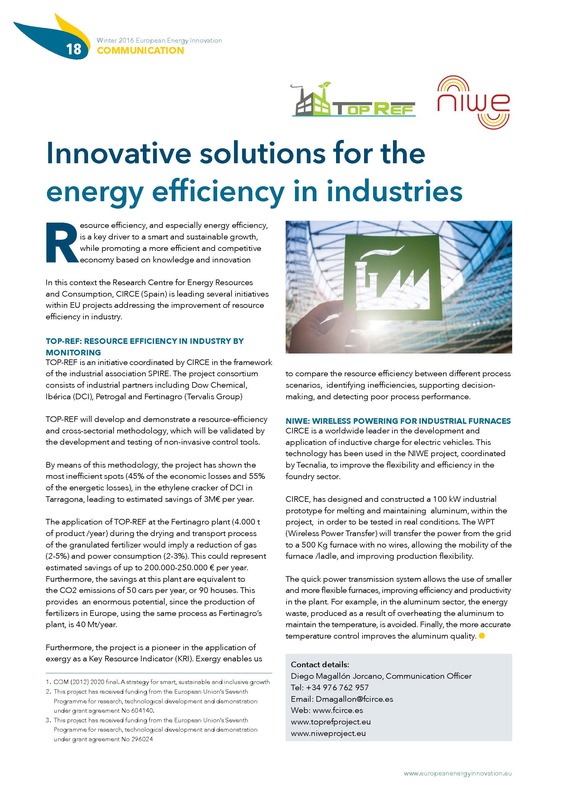 The TOP-REF coordinator, CIRCE, has collaborated with the European Energy Innovation journal in the release of an article about two of its main project regarding industrial energy efficiency, being TOP-REF one of them. The article offers a brief overview of the latest project achievements, providing to the journal audience a general overview of the project scope. It also includes information about another project aimed at the improvement of industrial efficiency, in this case by means of new furnaces based in the induction technology. The project is named NIWE – New Induction Wireless manufacturing Efficient process for energy intensive industries– and is coordinated by another TOP-REF partner, the Tecnalia Research & Innovation Foundation. European Energy Innovation is one of the major European initiatives in the energy and transport sector. It involves the main European companies working together with public EU authorities to present the latest in technological, social-economic, regulatory and environmental breakthroughs in this field. The article can be found in the following link, as well as in the Publications section with other scientific articles.